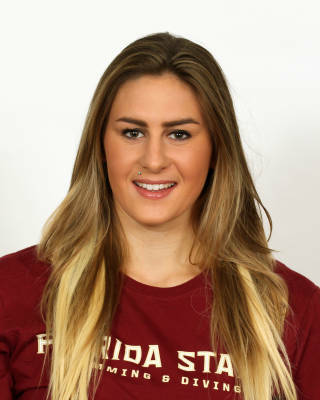 Became the first Seminole since 2004 to capture two individual All-America honors at the same NCAA Championships when she placed eighth in both the 100 and 200 fly…helped the 200 medley relay to a 13th place finish at the NCAA Championships setting a new FSU record of 1:37.25…was also 23rd in the 100 back with a career best of 52.63…took silver in both the 100 fly and 200 fly events at the ACC Championships…lowered her FSU record in the 100 fly at the meet…placed fourth in the 100 back… earned NCAA invitations in all three of her indivdual events…helped the 200 medley relay to an NCAA A standard in December…originially broke the ACC record at the 2014 Georgia Invite by swimming a time of 1:53.68, lowering her school record and swimming the second fastest time in the nation in 2014-15…lowered her school record in the 100 fly to 51.80 at the Georgia Invite…turned in a career best in the 200 IM at the Georgia Tech Invite…earned the ACC Swimmer of the Week after her swims at the Georgia Tech Invite. As a rookie, Britt qualified individually for the NCAA Championships in the 100 and 200 fly… she swam the fly leg in the FSU record-setting 400 medley relay that placed 14th and captured All-America honorable mention accolades…contested in three individual championship finals at the 2014 ACC Championships…she nearly took gold in the 100 fly where she set a new FSU record in the event with a 52.32 and placed second…earned bronze in the 200 fly with another school record time of 1:55.51…added a seventh place finish in the 100 back with a time of 53.54…helped the Seminoles to a sixth place finish and NCAA `A’ time in the 200 medley relay before earning fourth in the 400 medley relay….both races were school records…an instrumental part of the fly events all season. A state record holder in the 100 fly with a time of 53.83 while representing Lake Highland Prep School…a three-time state champion in the 100 fly and a three-time runner up in the 100 back…qualified for the 2008 and 2012 Olympic Trials in the 100 and 200 fly as well as the 200 IM…was a member of the USA Junior National Team in 2012…crowned Central Florida’s Swimmer of the Year in 2008-2010 and was named as the Athlete of the Year in 2009 and 2010. Born October 27, 1994…daughter of Robert and Marcia Britt…graduated from Boone High School in 2013…a member of Highlander Aquatics where she is coached by Michael Curley…is a member of the Braves Animal Rescue Club…sister finished her swimming career at University of North Florida and her father played basketball at UCF.